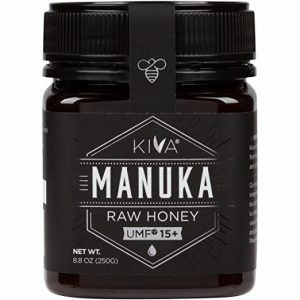 After 40 hours researching Manuka honey’s unique healing properties and comparing 24 different manuka honey brands, our top pick for the best manuka honey is Kiva’s Raw Manuka Honey UMF 15+. In this buyer’s guide, we’ll give you our top manuka honey picks and tell you the important things to consider when buying manuka honey. What does the UMF grade mean? 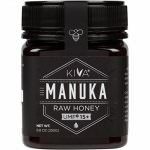 Our top pick for the best manuka honey for most people is Kiva Raw Manuka Honey UMF 15+. Its rating of UMF 15+ means that it’s suitable for the widest variety of uses from treating cuts and burns to reducing acne and improving digestive health. It’s also a raw honey, which gives it even more potent health benefits. 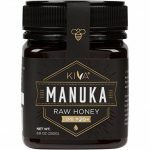 Kiva’s UMF 15+ Manuka honey is consistently one of the most affordable UMF 15+ manuka honeys, making it a great value as well. Comvita is New Zealand’s largest manuka honey producer. They’ve been producing manuka honey since 1974 before there was any scientific evidence of manuka’s health benefits, so they know their stuff. 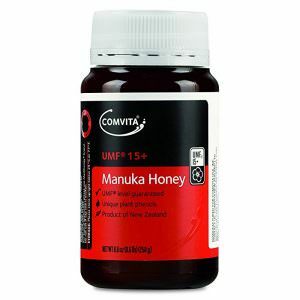 Like our top pick, Comvita’s Manuka Honey UMF 15+ is a versatile UMF 15+ rated manuka honey. One of the drawbacks is that it’s not a raw honey so its health benefits aren’t as potent as our top pick. It occasionally goes on sale though, so check the price and if it’s substantially lower than our top pick (or if you can’t find our top pick) we recommend giving it a try. 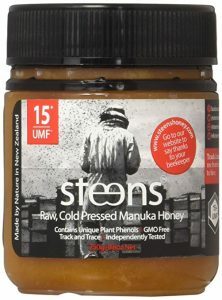 Steens is typically on the higher end of a the price scale but Steens Raw Manuka Honey UMF 10+ is actually a surprisingly good value. It’s therepeutic benefits aren’t as potent as our other picks but they do go the extra mile with their cold pressed extraction process. They only extract their honey at hive temperature (96 degrees fahrenheit) to avoid denaturing the amino acids & enzymes and ensures a higher nutrient content for their honey. Like we mentioned in our budget pick, the method Steens uses for extracting and processing honey is top notch and does a great job preserving the health benefits of their honey. If you’re looking for the best and don’t mind paying a bit more for it, Steens Raw Manuka Honey UMF 15+ is a great choice. Tahi has achieved a carbon neutral status by planting over 250,000 native trees and shrubs where they place their hives. They also practice responsible harvesting and take care of their bees by allowing the bees to sustain themselves on the honey they produce. Most honey producers harvest all the honey and feed their bees on a mixture of sugar water which is significantly less nutritious than the honey the bees produce. 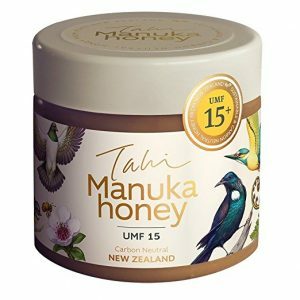 If you like the idea of supporting an eco-friendly company, Tahi’s Raw Manuka Honey UMF 15+ is a great choice. It’s a raw honey and has a UMF 15+ rating, so it’s just as potent as our top pick. The only reason it wasn’t our top choice was due to the higher price tag. 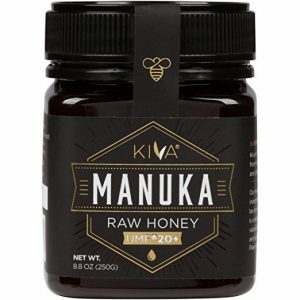 Kiva’s Raw Manuka Honey UMF 20+ is a great choice if you’re trying to treat digestive issues, a bacterial infection, or want something more potent than our top pick. It’s UMF rating of 20+ means it’s among the most potent manuka honeys that are easily available. You can find grades higher that 20+ but there is a substantial price difference and they can be hard to find. Like our top pick, it’s a raw honey so it has additional health benefits and it’s one of the most affordable UMF 20+ manuka honeys around. It’s tough to choose a best overall brand but Kiva ticks most of the boxes. They produce high grade, raw manuka honey at a reasonable price. While the quality may not be as quite as high as Steens manuka honey, at roughly half the price it’s pretty great value. The first thing we considered was the quality of the honey. Research shows that not all manuka honey has non-peroxide activity (NPA). This is the antibacterial activity that is totally unique to manuka honey and works synergistically with honey’s natural antibacterial characteristics. NPA is essentially why manuka honey is so highly prized. Our primary concern was to evaluate each of the honeys to make sure it had beneficial levels of NPA. To do this we made sure each honey brand was registered with the UMFHA and individual honeys had a minimum rating of UMF 10+. Higher ratings indicate greater levels of NPA but a grade of UMF 10+ is the minimum level required for the honey to have therapeutic benefits from NPA. While UMF 10+ is the minimum rating we looked for, having a higher grade makes the manuka honey more useful for treating a variety of issues. Higher grades are particularly useful for treating infected wounds or digestive issues. Many UMF 20+ manuka honeys can be more than $100 for an 8 ounce bottle, which is pretty pricey for most people. Unless you’re suffering from a digestive problem like IBD, IBS, gastritis, or are trying to treat an antibiotic-resistant bacteria like MRSA, most people probably don’t need a UMF 20+ manuka honey. Ideally, you’d have several grades of manuka honey available to you to treat different issues as they come up but this isn’t practical for most people. We found that a UMF 15+ grade manuka honey offers the widest variety of uses at a reasonable price. If you’re only going to have one jar of manuka honey in your home, a UMF 15+ grade is the sweet spot. Secondly, we favored raw honeys that aren’t heated above 118 degrees fahrenheit. Honey is naturally rich in enzymes and amino acids which can aide digestion and boost your immune system. Most manuka honey is heated to temperatures of over 150 degrees fahrenheit to make it easier to extract and process the honey. Heating the honey to high temperatures denatures the enzymes and amino acids, effectively removing the health benefits provided by them. Raw honey also has high levels of naturally occurring hydrogen peroxide. This hydrogen peroxide gives manuka honey additional antibiotic qualities and works synergistically with the non-peroxide activity found in manuka honey to fight bacteria. Hydrogen peroxide is also sensitive to heat and degrades very rapidly when exposed to high temperatures, which is another reason to favor raw honey. Our final consideration was price. There is surprising variability in the price of manuka honey but once we set our first two criteria it became a search for finding the best value. There are a variety of manuka grading systems on the market; some are good and some are downright misleading. While it’s possible to get quality manuka honey under other grading systems, you really have to do your research and understand which grading systems you can trust. UMF is the most widely recognized manuka grading system and unless you have a specific reason, we recommend sticking to manuka honey that has a UMF label on it. The Unique Manuka Factor (UMF) grade is effectively a guarantee of the purity and quality of the manuka honey in the jar. The higher the grade, the more potent the non-peroxide activity of the manuka honey. The lowest grade starts at UMF 5+ and typically goes as high as UMF 25+. The UMF grading system was created and is a registered trademark of the Unique Manuka Factor Honey Association. Any honey producer that wishes to participate in the UMF grading system must be licensed by the UMFHA and have their honey tested to ensure quality. The UMFHA is an independent third party that tests the quality and purity of manuka honey. They test the honey after it’s been extracted from the honeycomb and after it’s packaged in jars. They also run random audits of honey on the market. The actual number next to the UMF logo is the assay number (commonly referred to as the grade of the honey) and reflects the strength of the honey’s NPA. The number reflects the NPA strength of the honey relative to the antibiotic strength of phenol. The benefits of the honey’s NPA aren’t really present at levels below UMF 10+, so if you’re looking for a good quality manuka honey get something that has a rating of at least UMF 10+. It’s the combination of these characteristics that makes manuka honey an effective treatment in a variety of capacities. Manuka honey is possibly best known for its antibacterial qualities. A number of factors work together to give manuka honey its antibacterial activity. Individually, these factors are not nearly as effective. It’s when all these factors work together synergistically that they become greater than the sum of their parts and provide the most potent antibacterial activity. Hydrogen peroxide occurs naturally in all honeys. The hydrogen peroxide found in honey is the byproduct of a reaction between an enzyme called glucose oxidase and the glucose found in flower nectar. The enzyme comes from the honeybees and is mixed with the flower nectar when they regurgitate the nectar into the honeycomb. This enzyme works to break down the glucose in the nectar and is an important part of the process that turns flower nectar into honey. The hydrogen peroxide found in honey is the same stuff you put on cuts and scrapes as an antiseptic, just in much smaller quantities. The amount of hydrogen peroxide can vary from honey to honey and is also impacted by how the honey is extracted, processed, and stored. High temperatures and exposure to UV light from the sun causes the hydrogen peroxide to break down. In general, honey that is raw and stored in opaque containers have the highest levels of hydrogen peroxide and higher levels of antibacterial activity. While hydrogen peroxide can be found in all types of honey, manuka honey has a unique kind of antibacterial activity researchers call non-peroxide activity (NPA). This non-peroxide activity is still active even when the hydrogen peroxide in the honey is neutralized, hence the name non-peroxide activity. Though researchers are still trying to fully understand where manuka honey gets its unique NPA, most agree that the compound primarily responsible is methylgloyoxal (MGO). MGO occurs naturally in some honeys but manuka honey can have over 100 times the amount of MGO normally found in honey. It’s important to recognize that just because a honey is manuka honey, it doesn’t necessarily mean that has high levels of MGO and NPA. The level of MGO can vary wildly between different manuka honeys. It’s possible for manuka honey to have such low levels of MGO that it doesn’t have any NPA, meaning it has no antibacterial activity above that of regular honey. This is where manuka honey grading systems like UMF come in. The best manuka grading systems will convey the level of NPA in the honey, making it easy to assess the quality. However, some grading systems do not convey the level of NPA in the manuka honey, so it’s important to know which manuka grading systems you can trust. UMF is the most widely recognized grading system and we’ll go over what it entails later in this article. Honey has an osmotic effect on wounds and bacteria. They honey draws out the water content from the wound and bacteria which limits the bacteria’s ability to grow. For some types of bacteria, this osmotic effect is strong enough to kill the bacteria outright. The research around manuka honey’s ability to fight off viruses is still relatively young and the number of viruses it has been tested agains relatively few. Despite that, early research shows promising results. Researchers have tested manuka honey against both influenza as well as varicella zoster (virus that causes chicken pox and shingles). In both cases, they found that manuka honey was effective at inhibiting the growth of the viruses. While manuka honey didn’t outright kill the viruses, it prevented them from spreading which could give your body an edge in fighting off the viruses naturally. More research needs to be done to see if manuka is effective against a wide variety of viruses or just a select few. Besides being able to kill bacteria that can cause inflammation in the first place, honey has been shown to reduce inflammation in general. Researchers are still trying to fully understand the mechanics of honey’s anti-inflammatory nature. Current research suggests that honey’s anti-inflammatory action is a combination of its osmotic nature and antioxidants present in the honey. The osmotic effect honey has on bacteria also works to reduce inflammation in swollen areas. Antioxidants also contribute by preventing cellular oxidation, which helps to reduce inflammation. Reduced inflammation promotes healing and reduces pain by relieving pressure on nerve endings. Honey promotes healing by creating a moist healing environment with a low pH level. Wound healing requires the growth of cells and cells thrive in a moist environment. In addition, honey’s acidic nature helps cells absorb oxygen which helps tissue growth through the Bohr effect. Oxygenated cells are also better able to fight of bacterial infection. A moist healing environment also reduces scarring. When wounds heal in a dry environment, they heal with a bumpy scab that creates an uneven scar surface. In a moist environment, a wound is able to heal with a smooth surface which reduces the appearance of scarring. On top of that, a wet healing condition reduces inflammation and the pain associated with it. Given manuka honeys healing characteristics, it get used to treat a variety of issues. Here’s an overview of manuka honey’s common uses. If you want more detailed info, we’ve covered this topic in great detail in our article about the uses and benefits of manuka honey. Manuka honey has been shown to effectively kill Clostridium difficult and Helicobacter pylori, which are associated with a number of digestive issues including certain types of IBD and gastritis. Besides being able to kill these bacteria, manuka honey’s anti-inflammatory quality is thought to reduce the inflammation associated with these conditions. The anti-inflammatory qualities of honey helps reduce inflammation in sore throats healing to alleviate pain. Manuka honey’s anti-inflammatory and healing qualities make it a great salve to put on cuts and burns. Its antibacterial activity also helps prevent infection. Using manuka honey under bandages also makes changing bandages less painful. Topical treatment of acne with manuka honey helps by killing the bacteria-causing acne in pores and reducing the redness and pain associated with inflammation. The wound healing qualities also help to speed recovery and reduce scarring for severe breakouts. Honey is a natural humectant, so it helps to moisturize skin. The antioxidants in honey also help to prevent oxidation and cellular damage, which can have anti-aging effects. Manuka honey helps to soothe skin conditions by reducing inflammation and redness. Its moisturizing effect also helps to reduce dryness and flakiness which also helps to reduce itchiness. The wound healing benefits can also help to speed recovery and reduce scarring. Manuka’s ability to kill antibiotic-resistant ‘superbugs’ like MRSA is arguably one of its most well known uses. A number of studies have demonstrated that MRSA is particularly susceptible to manuka honey and some hospitals have started using sterilized manuka honey to prevent the spread and to directly treat MRSA infections. A recent study demonstrated manuka honey’s ability to fight gingivitis-causing bacteria. The study found that plaque was reduced by 34% and bleeding sites caused by the bacteria were reduced by 65%.